"Ernest, the great writer, standing in the middle of the story"
I find it intriguing when an author’s second novel is very different in subject from his or her first makes me want to look for the deeper connections that point to what the writer’s key concerns may be. Naomi Wood’s first novel, The Godless Boys (2011), concerned an alternate history in which atheist rebels had been exiled to an island off the coast of a theocratic English state. What does any of that have to do with Ernest Hemingway’s wives? Ah, but it’s not the subject that counts: it’s the treatment. The Godless Boys could be seen as a ‘what if?’ character study: place a set of characters in an unusual situation, and explore how they might react. Wood does a similar thing in Mrs. Hemingway; it’s just that the unusual situation is real, as are the characters. What makes the situation of Hemingway’s wives particularly unusual is there in the book’s first sentence: ‘Everything, now, is done à trois (p. 3).’ The scene is the Hemingways’ villa in the French coastal town of Antibes, 1926: Ernest’s marriage to his first wife, Hadley, is on the ropes. She invited his mistress, Fife, to the villa in the hope of stopping the affair in its tracks; instead, Fife has effectively become part of the Hemingway household, and Hadley comes to realise that it’s only a matter of time before she loses Ernest to the other woman (when Ernest and Hadley leave the villa one morning, trying not to wake Fife, ‘it feels, to Mr. and Mrs. Hemingway, as if they are the ones who are having the affair,’ (p. 5). They walk down the Élysées together, Mrs. Hemingway and Mr. Hemingway’s mistress…They stop off at the tobacconist to see if they can get more cigarettes. Martha holds out the door for her and lets the other woman in (p. 184). The idea of an affair and subsequent divorce has gone from something to be fought against, to the price that one pays for loving Ernest Hemingway. Some of the wives even keep in touch with each other down the years. So the title of Mrs. Hemingway is just that: a title, not an individual; almost an office, to be held for a finite term. 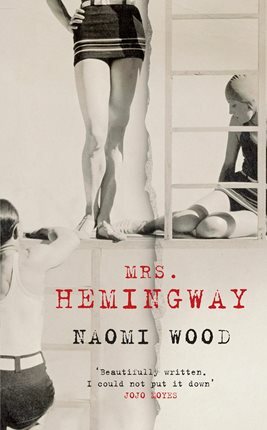 Wood delineates the different ways in which Hemingway’s wives perceive that title, also showing how the women change as they move from mistress to wife (and beyond), and how the way others perceive them may not be how they actually are. For example, Hadley sees Fife as the kind of modern, confident young woman that she is not; when the story is told from Fife’s viewpoint, we see that she’s not quite so self-assured; but Fife’s glamour returns when Martha meets her some years later. There’s another interloper in all these relationships: Hemingway’s writing. It is so often what brings Ernest and his lovers together; and so often what ultimately drives them apart. When Hadley meets Hemingway, his writing is one source of his charisma, and something he wears lightly (‘I’d rather be read by crooks than critics,’ he says at a party in Antibes [p. 58]). By the time he’s living with Fife in Key West, Ernest has become rather more concerned with what the critics think; his relationship with his writing grows more troubled as the years go by, and he sometimes turns violent. When we meet the widowed Mary at the Hemingways’ Idaho home in 1961, there’s a rueful double irony: all that’s left of Ernest is his writing, and his papers are now what feed the fire. Mrs. Hemingway explores the characters of four women united by an experience that places them in opposition to each other, yet is also something only they can ever share. As in her debut, Wood depicts lives and individuals shaped by an extraordinary external force (in this case, their encounters with the person of Ernest Hemingway), and creates a fine work of fiction in the process. M. Denise C. interviews Naomi Wood. Have you read the Paris Wife? It is mostly about Hadley, but might make an interesting comparison here. And what’s the deal with all these novels about famous writers’ wives? Why is that a thing? I definitely want to read this; as Tanya has mentioned it would make an interesting comparison to The Paris Wife, another book on Hemingway’s love affairs. Thanks for the comments, folks. I haven’t read The Paris Wife, but Wood does mention it in her afterword to Mrs. Hemingway. I am finding myself quite intrigued at the thought of reading it for a comparison. It might be naive of me to ask this, but are there many novels about writers’ wives about at the moment? I haven’t noticed a trend, but maybe that’s just me! Brilliant post, David 🙂 I’m just about to make a start on Mrs. Hemingway too! Also, Constance: The Tragic and Scandalous Life of Mrs. Oscar Wilde is a relatively recent book of late, also about a famous author’s wife. What a great review. This is a book I’d love to read. I am very curious about fiction that is essentially the beyond of biography – all the things biographers would love to say but can’t because they are speculative. I guess that there are so many biographies on Hemingway now and they are all so very enormous that there’s nothing left to do but turn to fiction to probe all the corners of his life that remain factually opaque! Thanks, litlove, very kind of you to say. One of the things that intrigued me about this book was how carefully structured and patterned it is; I don’t know whether Wood was using that to highlight differences she found in the wives’ biographies, or whether some/all of it was her own invention. Something to ask the author, if ever I have the chance.